As you may have noticed, I’ve been trying to make the navigation on the website a bit easier. In the right hand “sidebar” you can now find quick links to most popular kinds of puzzles. The “Sample Puzzles” category contains hundreds of puzzles which I’ve been posting since 2005. A nice feature is that when you flick through the pages of this category, you will see small images of the puzzles, so you’d know what to expect. And as promised, I will continue adding more basic or “staple” variants of puzzles that I never posted before in the sample puzzles category. 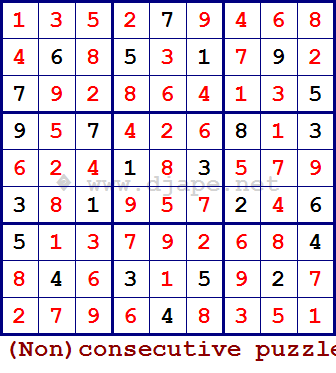 One such puzzle is Non consecutive Sudoku. I’ve posted a few variants of this variant :), but never a plain non cons puzzle. Of course, they do often feature on the Daily Sudoku page. Anyway… here is the puzzle. The difficulty is just enough, I think, challenging but not too difficult. What do you think? And of course be warned: it looks like ordinary sudoku but it’s not! It’s a non cons, meaning that you can’t place two consecutive numbers next to each other, neither horizontally nor vertically. Oh… and I’ve removed the “Like” button requirement for new puzzles. For old puzzles you do have to click “Like” in order to access them. This is purely so that more people can reach those puzzles, because by sharing you notify other people of something. And as promised, the Killers, Samurais and Variants are easily accessible again, except on Tuesdays when they are accessible 50% of the time and the other 50% of the time you should “Like” them first. This entry was posted in Free sample puzzles, Sudoku Variants and tagged BRAIN, Consecutive Sudoku, Daily Sudoku, killer, Non Consecutive, Non Consecutive Sudoku, sample puzzle, Sample Puzzles, samurai, variant. Bookmark the permalink. Post a comment or leave a trackback: Trackback URL. I just love your Non-Consecutive puzzles. Years ago I bought your book of NC and have watched for another one. Any chance you are going to make another one?